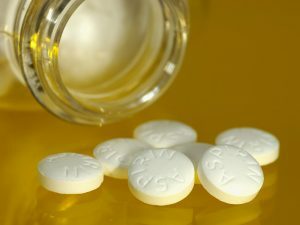 Can A Daily Low-Dose Aspirin Reduce Risk from Cancer Death? The old adage says that an apple a day keeps the doctor away but a new study suggests that you might want to trade out that apple for an aspirin. According to this study, simply taking an aspirin a day might actually reduce your chances of dying from cancer. The lead study author, also of Harvard Medical School, goes on to explain how the study showed the largest reduction in mortality risk was found among colorectal cance: women saw a 31 percent reduction in colorectal cancer risk and men saw a 30 percent reduction in colorectal cancer risk when regularly taking aspirin. In addition, a regular aspirin regimen say an 11 percent lower risk in breast cancer deaths among women and 23 percent lower risk of prostate cancer deaths among men. Men also saw a reduced risk of lung cancer death. The study looked at more than 86,000 women who took part in the Nurse’s Health Study between 1980 and 2012 as well as more than 43,000 men who took part in the Health Professionals Follow-Up Study (from 1986 to 2012). During their respective study periods, more than 8,200 women and roughly 4,600 men died from cancer. Overall, risk of cancer death was 7 percent lower for women who took aspirin regularly and 11 percent lower for men who took aspirin regularly. Clapper also makes sure to note that there is more to aspirin than just this study. For example, in some studies, a daily aspirin has been shown to reduce risks for heart disease and stroke but has also been found to increase risk for gastrointestinal bleeding. She goes on to say, “We have to make sure that individuals understand that chronic use may not be for everyone, that one size does not fit all,” basically advising that people investigate if this regimen will do them more benefit than harm.